DUNEDIN-FL, The Dunedin Blue Jays 2017 Charity Bowling Tournament sponsored by Achieva Credit Union raised $12,820 for Ronald McDonald House Charities of Tampa Bay. 250 local baseball fans participated in the event, joining the entire Dunedin Blue Jays team at Maple Lanes Countryside Bowling Alley in Clearwater for a day of bowling, raffles, silent auctions, and prizes during the team’s fourth annual tournament. Since 2014, the event has raised over $35,000 to support the well-being of local families through Ronald McDonald House Charities. “The Blue Jays are incredibly grateful for the support of Achieva and the many other sponsors of the event, our players for dedicating their time to helping the local community, and most of all for the two hundred and fifty fans who helped make this year’s event a success,” Kathi Beckman, the Blue Jays Manager of Community Relations, said following the event. This year’s event set a new record for total dollars raised, surpassing the $11,339 raised during the team’s 2016 bowling tournament. Over $4,500 of the final $12,820 total was raised by the participants of the bowling tournament, each contributing $25 for two games of bowling, a catered lunch, and the opportunity to meet and greet the Blue Jays team. 40 local businesses from the Dunedin area contributed as Lane Sponsors at the event, raising $4000 of the total. The event’s silent auction, which included packages donated by local businesses as well as apparel and memorabilia donated by teams throughout the Toronto organization, raised over $2,400. A 50/50 raffle and Opportunity To Win raffles combined to raise just under $1000. FORT MYERS, Fla. (August 1, 2017) – The Fort Myers Miracle, Advanced-A affiliate of the Minnesota Twins, are proud to announce Mason Wilbanks as their 2017 Florida State League/Miami Marlins Scholarship Award winner. This is the eighteenth (18) straight year for the program, and it is funded by the Miami Marlins and the Florida State League. Each scholarship has a monetary value of $1,500 and is presented to a student employee, child or grandchild of an employee. A total of 216 scholarships have been awarded to qualified applicants since the inception of the program. A rising senior at Florida Gulf Coast University, Mason came to Hammond Stadium each day with a smile on his face and a willingness to help the team in every way possible throughout the summer. He has been a part of the intern team since 2015 when he worked during the Twins’ Spring Training season. The native of Fleming Beach, Florida and graduate of Fleming Beach High School is expected to graduate from FGCU in the spring of 2018 with a degree in Business Management with a Sports Concentration. To stay up to date on upcoming promotional nights, follow the Miracle online at Miraclebaseball.com or through social media; Twitter: @MiracleBaseball, Instagram: fortmyersmiracle, Facebook: Fort Myers Miracle, Snapchat: ftmyersmiracle. To purchase tickets, visit MiracleBaseball.com/tickets. For information or questions regarding the 2017 25th Anniversary Season, call the Miracle offices at (239) 768-4210. Tampa, FL. – The Tampa Yankees, in conjunction with the Florida State League and the Miami Marlins, are pleased to announce Lyndsay Kane as their 2017 scholarship award winner. The Florida State League Scholarship committee award 12 individuals with educational scholarships. The committee approved the awards after a review of the applications submitted by all the Florida State League teams. Lyndsay Kane is currently enrolled at the University of South Florida where she is pursuing a degree in Nursing and has a 3.7 GPA. She previously attended Palm Harbor University in the medical magnet program for High School and then went to St. Petersburg College for one year. This is Lyndsay’s 5th season working the Tampa Yankees. Lyndsay was honored at the Tampa Yankees home game on July 15th at George M. Steinbrenner Field. In addition, she was introduced during a pre-game ceremony at the Miami Marlins game on Sunday, July 30th along with the other Florida State League teams’ award winners. CLEARWATER, Fla. – Prostate Cancer Awareness Night on Friday, August 11, serves as a fundraiser for the Morton Plant Mease Foundation and Ed Randall’s Fans for the Cure. In addition to on-field ceremonies, in-game entertainment, and vendors on the concourse, there will be a silent auction. Guest may bid on the special blue, game-worn jerseys Threshers players and coaches will be sporting on the field that night. Winners of the jersey bidding may go on the field after the game to receive their autographed jersey in-person from the player. Other items in the auction include Phillies memorabilia and merchandise and gift cards from local businesses. Be sure to visit Ed Randall’s Fans for the Cure table for a chance to win a team-autographed bat. Gates open at 5:30 p.m. for the 6:15 p.m. game with the Lakeland Flying Tigers. The first 1,000 men to arrive will receive a free Men’s Zipper Travel Bag courtesy of Academy Bus. “What band can perform the most iconic rock songs of all time? What band can play the most challenging hits that other bands would never dream to attempt? And what band has been thrilling local, national and international audiences for over 21 years? The answer is Tampa Bay’s Stormbringer band. Boasting the very same members for the last 21 years, Stormbringer effortlessly delivers air tight renditions of hit songs like Queen’s Bohemian Rhapsody, Pink Floyd’s The Wall and Bon Jovi’s Livin’ on a Prayer. A stunning concert act that also possesses a rockin’ catalogue of non-stop party and dance songs, the band provides crowd pleasing music to perfectly match any large event. Tampa, Fla. – The Tampa Yankees will host their annual “Christmas in July Toy Run” on Saturday, July 15th, presented by Full Throttle Magazine, Harley Davidson of Tampa and Fran Haasch Law Firm. Motorcyclists will deliver toys to St. Joseph’s Children’s Hospital before heading to George M. Steinbrenner Field. Gates will open at 5:30 p.m. and the Yankees will battle the Florida Fire Frogs at 6:30 p.m.
Motorcyclists are invited to bring an unwrapped toy to Tampa Harley Davidson before riding to St. Joseph’s Children’s Hospital to deliver the toys. Bikers are then welcome to ride onto the warning track at George M. Steinbrenner Field for the National Anthem and will receive free tickets, food vouchers and Tampa Yankee hats. Salute to Service Members Saturday will also be recognized. All military personnel receive a free upper reserved ticket with a valid identification. Also, select players will sign autographs on the concourse from 5:40 p.m. – 6:00 p.m.
Tampa, Fla. – The Tampa Yankees team up with BayCare for “Strike Out Cancer Night” on Saturday, June 3rd, in support of cancer awareness and research. Gates open at 5:00 p.m. and the T-Yanks take on the Jupiter Hammerheads at 6:30 p.m. After the game, fans are invited to stay for a fireworks show, presented by Avis and AIG. Players and coaches will wear custom “Strike Out Cancer Night” uniforms. Five select jerseys will be auctioned online at www.tampayankees.milbauctions.com; all others will be entered in a silent auction and available for bid at the game. 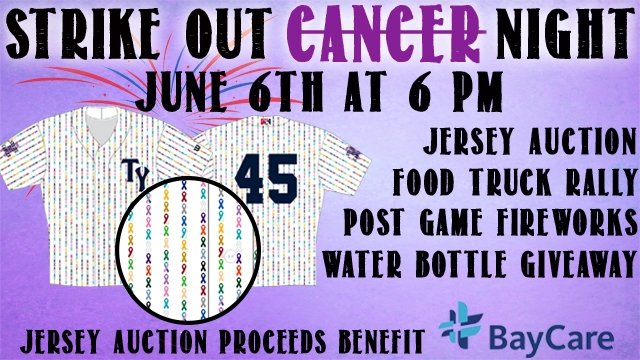 All proceeds from the jersey auction will benefit cancer awareness and research at BayCare. “BayCare is a leading not-for-profit health care system that connects individuals and families to a wide range of services at 14 hospitals and hundreds of other convenient locations throughout the Tampa Bay and central Florida regions. Inpatient and outpatient services include acute care, primary care, imaging, laboratory, behavioral health, home care, and wellness. Our mission is to improve the health of all we serve through community-owned, health care services that set the standard for high-quality, compassionate care.” – www.baycare.org. To purchase tickets for “Strike Out Cancer Night,” fans can visit the George M. Steinbrenner Field Box Office or by clicking here. Tickets start at $5 for upper reserved seating, $8 for lower reserved seating, and parking is always free. Bradenton, Fla. – The Bradenton Marauders will raise funds and awareness for the battle against cancer on Friday, May 12. The team has partnered with the Jake Taraska Foundation, a Sarasota-based charity helping those afflicted with pediatric cancer. JTF founder Jake Taraska is a pediatric cancer survivor. The Marauders host the Palm Beach Cardinals at 6:30 p.m. Gates open at 4:30 p.m. PORT ST. LUCIE, Fla. – Minor League Baseball recently unveiled the CommUNITY initiative program to encourage fans to come together and stand up against discrimination and violence. The St. Lucie Mets are proud to participate in the program that is in response to recent tragedies and tension in communities across the country. The Mets CommUNITY initiative will take place during the third inning of Friday’s second game vs. the Palm Beach Cardinals. MiLB’s goal is to get all 160 MiLB teams involved and have their fans leave a game feeling inspired with a sense of unity. Upon entering Tradition Field, fans will be given signs that read “Community Means” and the fans can fill in the blank of what community means to them. The fans and players will stand up and hold the signs in solidarity in the middle of the third inning. Friday’s doubleheader starts at 4 p.m. It is also First Responders Appreciation Night, which ties in with the CommUNITY initiative. In addition to various activities at the ballpark, Minor League Baseball teams and their fans can participate in the initiative on social media using #MiLBCommUNITY to pledge their plan to create positive change. For more information, contact Kasey Blair at 772-871-2115. CLEARWATER, Fla. – Friday, September 2, is Prostate Cancer Awareness Night at the ballpark with a post-game concert from Tampa Bay’s Stormbringer. 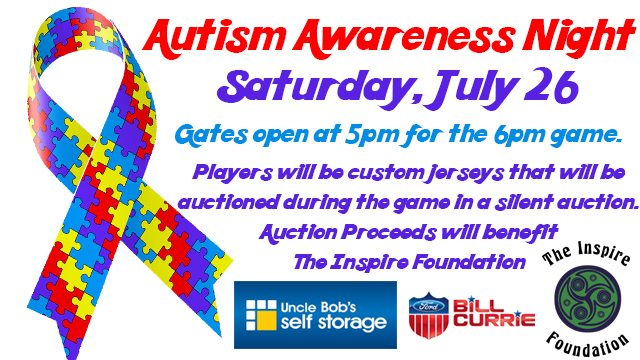 Threshers players and coaches will be wearing special blue jerseys that will be included in the silent auction to raise funds and awareness for the Morton Plant Mease Foundation and Ed Randall’s Fans For The Cure. The Stormbringer concert is part of the Threshers Summer Concert series by Leinenkugel and New Belgium. Fans who win a jersey in the auction can go on-field after the game to meet the player and receive the autographed jersey. Also included in the silent auction will be Threshers’ and Phillies’ memorabilia plus donations from team partners. The night is also the last Threshers Free Shirt Friday with 1,000 themed, blue T-shirts given away by Academy Bus. Gates will open at 5:30 p.m. for the 6:15 p.m. game with the Dunedin Blue Jays. 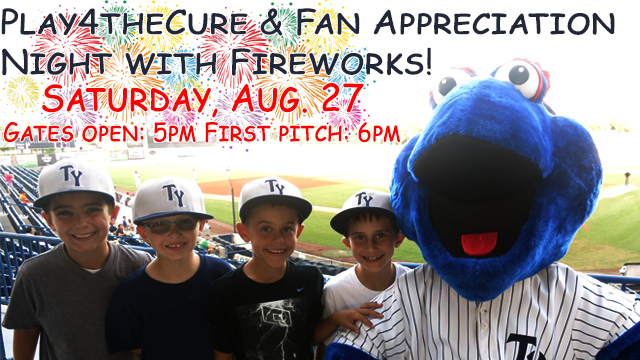 TAMPA, Fla. – The Tampa Yankees will host their annual Fan Appreciation Night on Saturday, August 27th. The Yankees are scheduled to play the Brevard County Manatees at 6:00 p.m. Fans are welcome to enjoy a night full of prizes and fun as the 2016 season comes to an end. The night will conclude with a postgame fireworks show, presented by Sonny’s BBQ. Play4TheCure and Minor League Baseball are teaming up for the second year in a row to raise funds for the National Foundation for Cancer Research. Proceeds from a 50/50 raffle, along with other fan games, will benefit cancer research. Players and fans will receive “I Play 4 ___” signs and are encouraged to fill them out to be recognized on the video board during the game. In addition, August 27th will also be the final “Salute to Service Members Saturday” of the season. All military receive a FREE upper reserved ticket with valid I.D. Kids run the bases before the game from 5-5:15 p.m. and receive player autographs on the concourse from 5:10-5:30 p.m. **Ticket special can ONLY be redeemed at the George M. Steinbrenner Field Box Office. Individual game tickets can be purchased at the George M. Steinbrenner Field Box Office. Tickets start at $4 for general admission, $6 for reserved seating, and parking is always free. Daytona Beach, FL – The Daytona Tortugas, in conjunction with the Florida State League and the Miami Marlins, are proud to award the franchise’s second Florida State League Scholarship to Account Executive Michael Edwards. “It means a lot [to win the scholarship]. I appreciate the opportunity to earn a scholarship, and winning it meant even more since it is the first scholarship I’ve ever been chosen for,” Edwards explained. “I didn’t want to pass up the opportunity to gain experience [with the Tortugas]. Working in the front office of a sports team is what I eventually hope to be doing,” said Edwards, a sports management major, about the internship. Tampa, Fla. – The Tampa Yankees plan to Strike Out Cancer Saturday, June 6th, when they take on the Clearwater Threshers at 6:00PM. The gates at Steinbrenner Field will open promptly at 5:00PM. The night is sponsored by BayCare. Fans are invited to come out to Steinbrenner Field early and enjoy a food truck Rally before the game. Trucks participating include Sarges BBQ, Disco Donuts, Kona Ice, Enjoi Sweets, PaniniRiffic, and Street Surfer. The first 500 fans to enter the stadium will receive a BayCare water bottle. To close out the night, there will be a fireworks display after the game sponsored by Sonny’s BBQ. Strike Out Cancer Night is also a Friends and Family Saturday Sponsored by Tampa’s Lowry Park Zoo. Fans can purchase Family-4-Packs which include four reserved tickets to the game, four hot dogs, four bags of chips, four sodas, four Tampa Yankees ball caps, and two passes to Tampa’s Lowry Park Zoo for just $38. The Tampa Yankees invite all children 14 and under to run the bases from 5:00-5:15PM. Some of the Tampa Yankees players will be on the concourse signing autographs from 5:10-5:30PM. The Pittsburgh Pirates and Bradenton Marauders are accepting registrants for the sixth annual Baseball Basics for Women clinic presented in partnership with Manatee Memorial Hospital. The clinic is intended for young adult and adult women interested in learning or refining their baseball fundamentals. It will be held Monday, March 23 from 6:30-8:30 p.m. at McKechnie Field. The registration fee is $45. Pirates Major League and minor league players and coaches will instruct participants in hitting, catching, running the bases, and fielding. Each of the women will also receive a free t-shirt, a goodie bag filled with great prizes , like a free massage at Elements Massage, and a ticket to the Saturday, March 28 Spring Training game against the Blue Jays. Gecko’s Grill & Pub will provide dinner after the clinic. The Kona Bar built by NDC Construction will be open for family members and guests during the clinic and for participants during dinner. All participants will be entered in a raffle for a ceremonial first pitch opportunity for the March 28 game. The Toronto Blue Jays announced their organizational award winners earlier today, and Dunedin’s RHP Taylor Cole and Hitting Coach Stubby Clapp each received tremendous honors. Cole has been named the winner of the Community Service Award, and Clapp will receive the Bobby Mattick Award for excellence in player development. 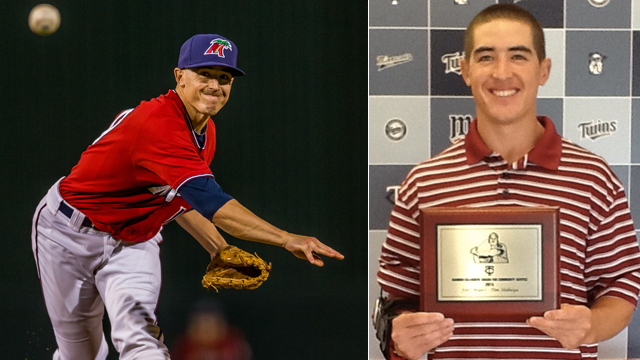 RHP Taylor Cole has been named this year’s winner of the Community Service Award. The 25 year-old right-hander was exceptionally active in the Blue Jays initiative programs serving youth. Among the programs Taylor participated in were the team’s annual Bookin’ it to the Ballpark reading program and summer Kickball Tour: a health and wellness initiative promoting an active lifestyle among kids of all ages at various summer camps. Additionally, Taylor led a group of teammates in a “Toys for Tots” shopping spree in support of the non-profit organization. Warm-hearted and selfless in his volunteerism, Taylor was always willing to answer a litany of questions from kids in an earnest manner, and took the extra time to sign last minute autographs in the classroom, at the ballpark and wherever fans could be found. In his words, “It’s our responsibility to give back, as so many have done for us.” On the diamond, Cole led all of minor league baseball with 171 strikeouts this past season. Stubby Clapp is being recognized as this year’s recipient of the Bobby Mattick Award for excellence in Player Development. Born in Windsor, Ontario, Stubby has spent the last two seasons as the Hitting Coach in Dunedin (A). A member of Canada’s 1999 Pan American Games team, 2004 Canada Olympic team and 2006 World Baseball Classic club, Clapp spent 11 seasons playing professionally, including 23 games for the St. Louis Cardinals in 2001. Clapp started his coaching career in 2008 in the Astros system, highlighted by a division crown with Tri City (A) serving as the teams Manager. Stubby was influential in the development of several key Blue Jays farmhands over the past two seasons and his dedication each and every day makes the award richly deserved. During the past season alone, C Derrick Chung, SS Jorge Flores, 1B K.C. Hobson, 3B Gustavo Pierre, RF Matt Newman and CF Dalton Pompey all earned promotions to Double-A and beyond after working with Clapp in Dunedin. This article originally appeared on the official website of the Dunedin Blue Jays. Click here to view the original story. 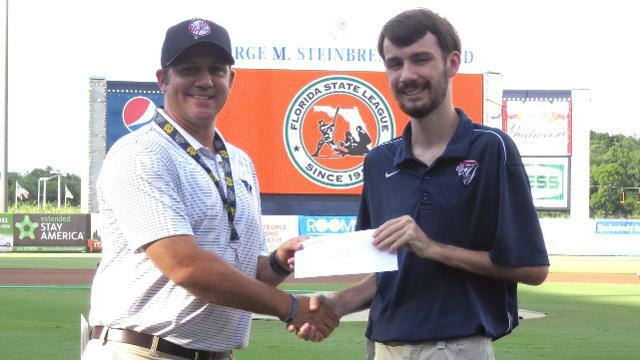 The Tampa Yankees, in conjunction with the Florida State League and the Miami Marlins, are pleased to announce Austin Kaufman as their 2014 scholarship award winner. The Florida State League Scholarship committee award 12 individuals with educational scholarships. The committee approved the awards after a review of the applications submitted by all the Florida State League teams. Austin Kaufman is a graduate of Robinson High School. He is currently attending the University of South Florida – St. Pete Campus before he plans to transfer to the University of South Florida – Tampa Campus. Austin plans to get his degree in Computer Science and Engineering. Austin is the son of Stadium Manager, Ron Kaufman who has been with the organization for 16 years. Austin will be honored at the Tampa Yankees home game on August 7th, versus the Brevard County Manatees at George M. Steinbrenner Field. In addition, he was introduced during a pre-game ceremony at the Miami Marlins game on Sunday, August 3rd along with the other Florida State League teams’ award winners. The Miami Marlins/Florida State League scholarship program is awarded to students that are an employee of, or the child or grandchild of an employee of the participating club and must be at least a high school junior by the 2014 fall term. The Miami Marlins have sponsored this program for fifteen years and have contributed over $137,000 to the Florida State Program. The Florida State League Scholarship Committee has awarded twelve (12) $1,500 educational scholarships to applicants from each team in the League. The Bradenton Marauders are proud to announce that James Dietrich has been selected as a scholarship recipient. The scholarship winners will be guests of the Miami Marlins in pre-game ceremonies on Sunday, August 3 at 1:10 PM. The Committee awarded the scholarships after a review of applications submitted by each candidate. The award is based both on financial need and grade point average of 3.0 on a 4.0 scale. Students eligible for this award must be an employee of, or the child or grandchild of an employee of the participating club and must be at least a high school junior by the 2014 Fall Term. The scholarship will aid Dietrich during his senior year at St. Petersburg College, where he is majoring in Mass Communications. After completing his associate degree this fall, Dietrich plans to pursue a bachelor’s degree in journalism at the University of South Florida St. Petersburg. His goal is to work in international journalism. Dietrich has been employed with the Marauders since 2012, working as a seller in the ticket office and as a front desk receptionist at Pirate City. The Miami Marlins have sponsored this program for 15 years and have contributed a total of $148,500. Florida State League President Chuck Murphy stated, “This program is one of the great things we do in the League and I again congratulate the Directors and General Managers on their dedication and enthusiasm in administering this program.” The purpose of the program is to send a message that an education is key to success in life. For more information about the Bradenton Marauders, call 941-747-3031, visit www.BradentonMarauders.com, or email MaraudersInfo@pirates.com. The Tampa Yankees will support Autism Awareness as they host their first annual “Autism Night” on Saturday, July 26 at George M. Steinbrenner Field against the Fort Myers Miracle. The game will begin at 6:00 pm & the gates will open to all fans at 5:00 pm. On “Autism Night,” custom jerseys will be worn by the players & coaches that will be auctioned off during the game. Auction winners will have the opportunity to get their jersey signed by the player or coach who wore it after the game. The auction will benefit The Inspire Foundation, a non-profit organization whose mission is to bring music and the arts to ALL children with special needs. Fans will also have the chance to win a 2014 Ford F150 STX if they enter the raffle at the game. Saturday, July 26th will also be Friends & Family Night, where Family 4-Packs will be available for $38. Included are four reserved tickets, hot dogs, bags of chips, sodas, TY caps & two passes to Tampa’s Lowry Park Zoo. Family 4-Packs can only be purchased at the Steinbrenner Field Box Office. Before the game, kids will have the opportunity to run the bases from 5-5:15 pm & player autographs will be given on the concourse from 5:10-5:30 pm. A face painter will be on the concourse as well from 5-7:00 pm. Tickets are $4 for general admission, $6 for reserved seating and can be purchased at the George M. Steinbrenner Field Box Office. The Tampa Yankees are the Single A-Advanced affiliate of the New York Yankees. For more information you may contact the Tampa Yankees offices at (813) 673-3055 or visit www.tybaseball.com. 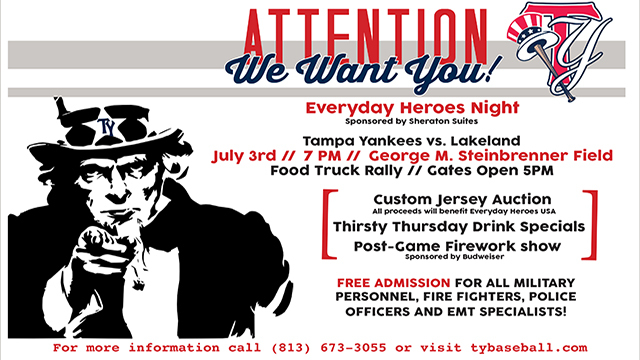 On Thursday, July 3rd the Tampa Yankees will host Everyday Heroes Night at George M. Steinbrenner Field to honor all those who work to keep our nation safe as they play the Lakeland Flying Tigers at 7:00 pm. The gates open at 5:00pm to all fans. All active & retired Military, EMT Specialists, Firefighters & Police Officers will receive FREE ADMISSION if they show up with a valid I.D. In honor of Everyday Heroes Night, each of the players will wear a customized jersey, which will be auctioned off during the game in a silent auction. All proceeds will benefit the Everyday Heroes non-profit organization and each purchaser will have the opportunity to have their jersey signed and meet the player it was worn by. Before the game, fans will enjoy a Food Truck Rally with Tasty Stacy, PAO Truck, Kona Ice, Hot Mess, Disco Donuts, Sarges BBQ, PaniniRiffic and Escomo. Everyday Heroes Night, lands on a Thursday and you know what that means…Throwback Thursday! Instead of paying $6 for reserved seating or $ 4 for general admission, fans will be able to purchase tickets like it’s 1994. Reserved seating will only cost $2 and general admission will be just $1. In addition to our reduced ticket pricing , fans can enjoy 14 oz. Draft Beers for $2, small sodas for $1 & half price nachos from 5-7 pm, presented by 98.7 The Fan. After the game, fans will enjoy a fireworks display as a celebration of Independence Day, courtesy of Budweiser. The Tampa Yankees are the Single-A Advanced affiliate of the New York Yankees. For more information please contact the Tampa Yankees offices at (813) 673-3055 or visit www.tybaseball.com.